After many decades, if not centuries, of neglect of fine food and high-level restaurants in Britain, we are seeing a massive explosion of interest in food, cooking, and dining out. Christel Lane's book charts the process of this transformation and examines top contemporary restaurants and their chefs. The Cultivation of Taste presents a comparative study of Michelin-starred restaurants in Britain and Germany, focusing on two countries without an indigenous haute cuisine but which nevertheless have developed internationally reputed fine-dining sectors, and comparing their development to the fine-dining culture in France. Written from a sociological perspective, chefs are portrayed as part of a complex network, in their relationships with their employees, their customers, gastronomic critics, suppliers of food, and even their financiers. It will appeal to academics in the areas of economic and cultural sociology, and those with an interest in small entrepreneurial firms and their work relations, but also to all those who have an interest in fine-dining restaurants and the chef patrons at the centre of them. The book draws on a large number of interviews with renowned chefs, diners, and Michelin inspectors to provide an unprecedented insight into what goes on in Michelin-starred restaurants-what makes their chefs tick, intrigues their critics, and beguiles or annoys their customers. Restaurants are viewed not simply as businesses but as cultural enterprises that shape our taste in food, ambience, and sociality. 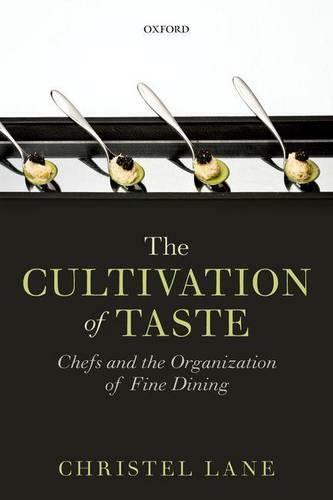 "The reader of this book is a guest at Lane's table as she parses the phenomena of fine dining, encouraging us to critically consider the gains of culinary exploration and the social organization of taste. Beyond the restaurant industry, her study of these "peculiarly outmoded business organizations" adds a comparative, geographically sensitive perspective to productive ongoing dialogues among economic, cultural, and organizational sociologists on the study of contemporary elite taste and cosmopolitanism."